Are you looking for information about homeschooling for high school students? Homeschooling can seem overwhelming once students reach the high school years. As parents, we don't want to fail our children. We want to make sure they are prepared to take advantage of every available opportunity once they leave our homes. I had the advantage of watching my cousins homeschool high school, and leave home to not only survive, but thrive. If my aunt (who will admit she barely graduated from high school) can successfully home school her children through the teen years - you can do it, too! Begin homeschooling high school with the end in mind. Does your child want to go to college? Does he or she want to pursue a specific vocation? Sit down with your teen and design a high school program that includes academic coursework and extracurricular activities that will move your child toward his or her goals. Foreign Language - 2 or more years. Here's a form you can use to create a four-year plan for your high school student. Simply fill in the form on your computer, or print it out and write on it. Colleges and universities will also want to evaluate your child's performance on standardized tests such as the SAT or ACT. Remember, you don't have to teach every subject. Your teen can work independently in some areas, and you can also make use of DVD programs, computer software, distance learning courses, online courses, homeschool co-ops, private tutors and local community colleges. Is your homeschooled teen planning to attend college? 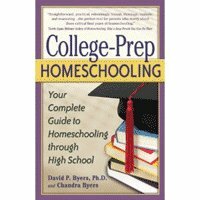 If so, you'll defintely want to add College Prep Homeschooling: Your Complete Guide to Homeschooling through High School to your reading list. The author, David Byers, is a proferssor who has a Ph.D. in education. Together with his wife Chandra, he has six children. At the time his book was written, his oldest child was in college on a full academic scholarshp, and the next oldest was a high school senior on his way to college on an academic scholarship. 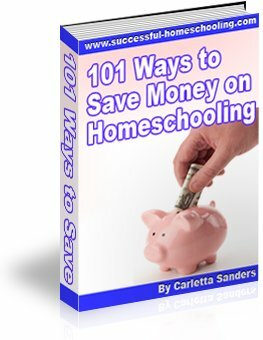 Preparing to end the homeschool journey. As a college professor, Dr. Byers knows what it takes to succeed in college. He places priority on teaching skills and concepts over facts which can be easily forgotten. He also encourages parents to teach their children how to think critically, and equip them to be self-disciplined, self-directed learners. The book also contains practical advice on homeschooling for high school students, including information about choosing curriculum, record-keeping, and the college admissions process. Follow this link to learn more about College Prep Homeschooling. Here are some articles that contain additional information about homeschooling for high school students, homeschool transcripts, diplomas, graduation and class rings. Preparing Homeschool Transcripts - Homeschool transcripts are detailed records of your student's high school performance. Here's some information about what your teen's transcript should include, along with links to resources that will help you prepare your child's transcripts. The Total Transcript Solution - Are you overwhelmed by the mere thought of creating high school transcripts? Here's my review of Lee Binz's Total Transcript Solution in which she shares the simple method of preparing transcripts that helped both her sons earn full scholarships to their first choice universities. Homeschool Graduation Ideas - Homeschool graduations are a celebration of all that your child has accomplished in high school. Here's some information about determining high school graduation requirements for your teen, along with ideas for planning a graduation ceremony that will be fun and memorable. Homeschool Diplomas - As a home educator, you are responsible for issuing your student's homeschool diploma. Here are some basic facts about homeschool diplomas, accreditation, and the GED exam, along with information about creating or purchasing a diploma for your graduate. Homeschool Class Rings - Homeschoolers are now celebrating high school achievement in many of the same ways traditional high school students have celebrated. Here are some reasons you may want to purchase a class ring for your graduate, along with tips for designing and purchasing home school class rings. Homeschool Prom - Homeschooling does not mean your children will miss out on important high school milestones, like the prom.. Here are some ideas for planning and attending homeschool proms. Lee Binz is a homeschool mom whose two homeschooled sons received scholarships to their top pick universities. In the video below, Lee describes the 5 mistakes parents make when homeschooling high school. Below that are transcripts of my interview with Lee. Why You Should Homeschool High School - We've yet to reach the high school years, so I asked Lee Binz, a mom who homeschooled her two sons through high school, to share her advice for homeschooling for high school students. This article contains part 1 of my interview with Lee, in which she discusses the advantages of homeschooling for high school students and shares tips for getting started. Designing a Program for Homeschooling High School - This article contains part 2 of my interview with Lee Binz of The Home Scholar, in which she shares information about choosing curriculum and equipping yourself to teach your high school student.